One of the biggest surprises from the recent STMA conference was the excitement created by a product we are reintroducing for 2019. This product had been absent from our catalog since 2007, but it really brings back fond memories for me. So much so that when our original manufacturer ceased production nearly 12 years ago, I refused to give up in finding a new supplier and, finally, my persistence was rewarded last spring. I’ve been itching to get this underrated product back in front of the groundskeeping masses ever since. In fact, I’ve been getting teased a bit here at Beacon because of my unbridled love for this classic product and my unrelenting quest to find a new manufacturer. So what product am I talking about? The venerable Wooden Field Rake. My first memories of the wooden rake go back to my teenage days when I would frequent Wrigley Field in the 1970s. 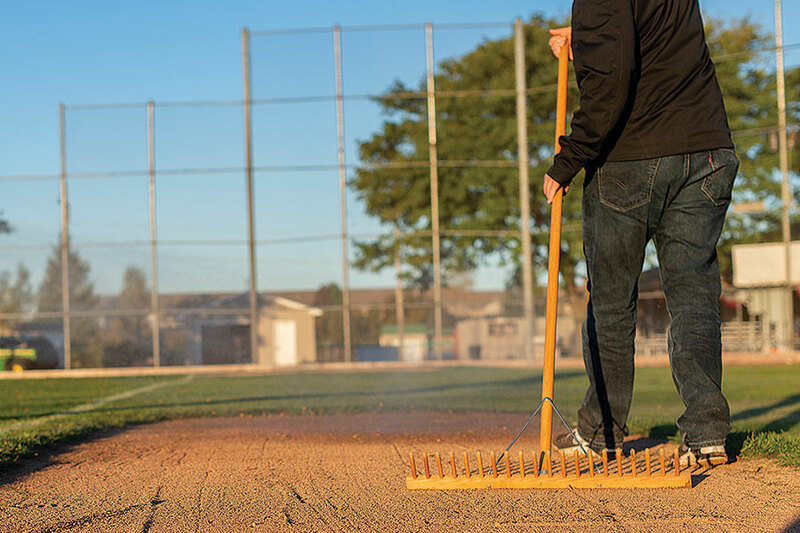 As I studied the ground crew, watching what they were doing, I noticed they were finessing their way around the infield skin with these wooden rakes — smoothing and grooming the skin to perfection. Fast forward to 1985. That was the year I joined the Baltimore Orioles as the assistant head groundskeeper. I was elated to find out they, too, were using the same wooden rakes — and everyone guarded their own rakes. It was very personal. You didn’t mess with each other’s rake. Each person would put some type of identification on the rake to let others know to keep their mitts off it. I found this phenomenon comical at first, but I very quickly fell in love with the wooden rake and became very protective of my rake. Most importantly, I discovered how awesome these rakes were for maintaining a field. First, they’re lightweight, which makes them easier to maneuver while causing less fatigue. When you flip the rake over to float an area, you have a nice wooden float that does the trick — much easier and more precise than the thin edge of an aluminum rake. Plus, if you need a narrower grooming rake — like when prepping to inlay pieces of sod — you can easily remove a few teeth to make the rake as narrow as you need it to be. 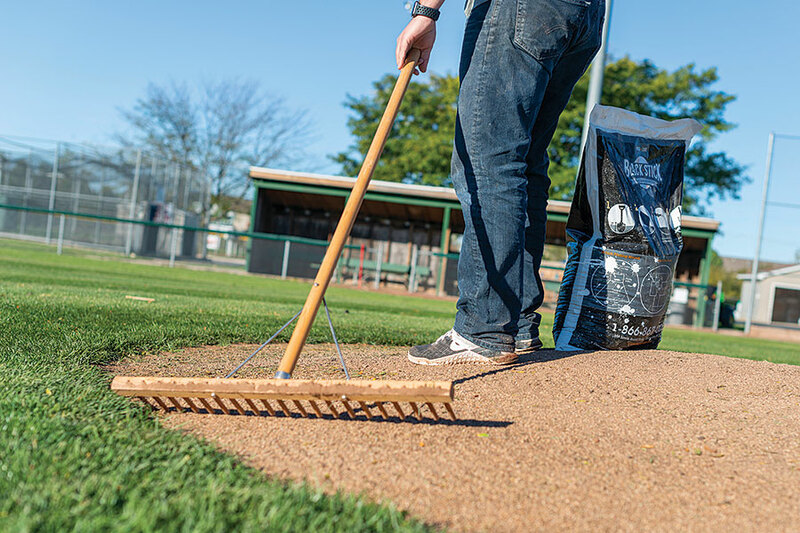 They’re great for use on any part of the infield skin, the warning track or even for removing aeration cores in the turf after aerification. Truth is, we had a couple aluminum rakes, but they were rarely used. Instead, we all preferred the versatile wooden rake. 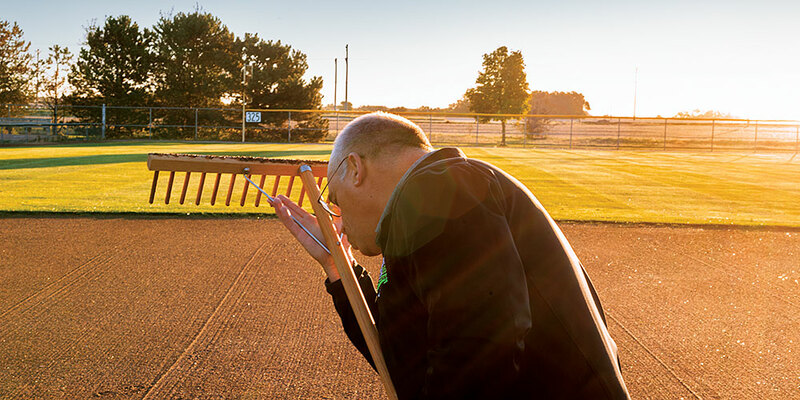 When I left the Orioles, I immediately introduced the wooden rake to Beacon Athletics and it became a mainstay of our field maintenance tools for many years. That is, until our supplier’s 100-year-old machine used to manufacture the rake became permanently and irreparably broken. So, when a new supplier had been found and we were finally able to unveil the wooden rake at the STMA show in Phoenix, I have to admit, even I was blown away at the response. The reaction from groundskeepers was genuine excitement — and some, you might say, were flat-out giddy, including current Orioles Head Groundskeeper Nicole Sherry (pictured below). It may not look like it, but trust me, she IS excited! One question that always comes up with the wooden rake is, “won’t they break easily if you toss them around like other tools?” The best way to handle that possibly is to give each crew member their own rake. 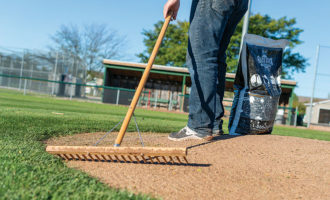 Much like our Orioles crew, they’ll take ownership over his or her rake, putting markings or tape uniquely on the handle to identify it as “theirs”. They’ll want to take care it to keep it in top shape and won’t be quite so cavalier about tossing it around. And if the teeth do break, it’s no problem. Replacing teeth is easy. Just use a 1/4-inch bolt to pop out the broken tooth and tap in a new one (our wooden rake actually ships with 4 replacement teeth). Over the years, my experience has been when it comes to the wooden rake that roughly half of those who try them absolutely love them, and half prefer to stick with their aluminum rakes. This is definitely an individual preference situation. But much like each carpenter has his or her set of tools they use to craft their woodworking projects, so do groundskeepers. I encourage you to give this timeless finesse tool a try for both yourself and your crew, and find out how you like the classic Wooden Field Rake. 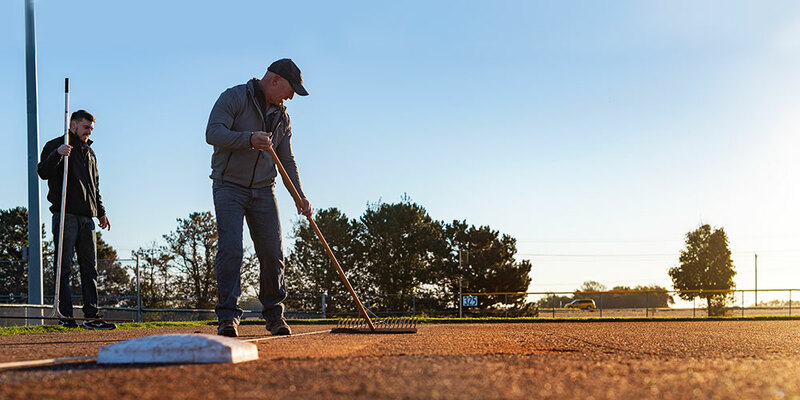 The 8 Essential Ballfield ToolsA Rake is a Rake... Or Is It?